At our brand new Pilates studio we're introducing group Reformer classes to Stratford upon Avon for the first time! So, what are Group Reformer Classes? Well, simply, they are classes for up to 6 people to use the Reformers in our studio. One of our highly qualified and experienced Pilates teachers will lead the whole group through the exercises together. I'm not even sure what a Reformer is! To the untrained eye it might look like an instrument of torture, but please don't feel intimidated by it! The Reformer is a versatile item of Pilates studio equipment - in fact, it's essential for studio Pilates. Despite all those handles and straps, the Reformer isn't a very complicated beast. It's just a sliding carriage on a frame, attached to springs and pulleys. 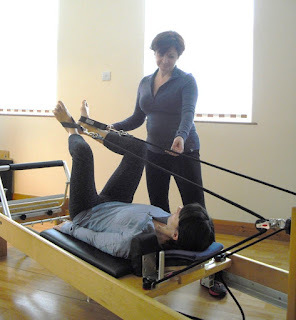 Reformer Pilates exercises are gentle but challenging, as you move the carriage against the resistance of the springs. How long? 45 minutes (daytime) or 60 minutes (evening). Where? Our brand new studio here in Stratford upon Avon. How much? Prices start at £10.16 per class. Who can attend? KEY classes are suitable for beginners. ENERGY classes are for those with a little more experience. How can I book? You can book and pay online here! If you have health problems please contact us to check if these classes will be suitable for you.